Georgina is a Partner at Oraro & Company Advocates in the dispute resolution practice group. With over seven (7) years’ experience, Georgina has advised local and international clients in a wide variety of complex employment and labour disputes in which she is highly regarded. She also advises on commercial litigation and family law. 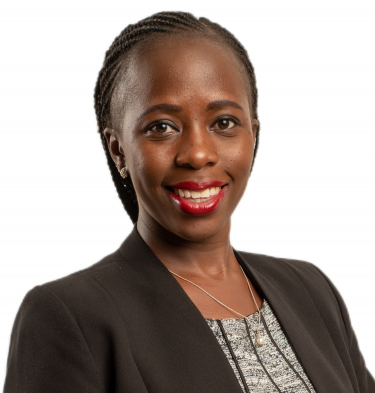 Georgina recently advised Aga Khan University Hospital Nairobi before the Employment and Labour Relations Court in a challenge against proposed potential redundancies of up to 500 staff. She has also advised BIDCO Africa Limited on their employee restructuring process. 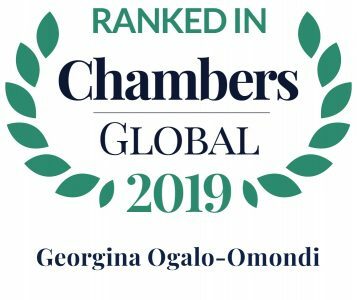 Ranked by Chambers & Partners in Employment, the Global Guide in 2019 lauded Georgina for being “energetic and articulate,” adding that she is “very well versed in employment matters.” Georgina has a double concentration in Bachelor of Commerce in Economics & a Bachelor of Laws (LLB) from the Nelson Mandela University, South Africa and a Diploma from the Kenya School of Law. Part of the team acting for an insurer against a claim arising from the 2007 post-election violence in Kenya, with a claim for damages within an exclusion clause under the policy against liability for civil commotion and riot. Part of the team acting in a commercial arbitration before the International Criminal Court (ICC). Representing a bank against a claim of approximately USD 200,000 for constructive dismissal and discrimination. Representing Nairobi’s top five-star luxury hotel in two employment claims revolving around claims of unfair termination and fraud allegations against the employees. We also advised the hotel on its internal HR policies and contracts. Represented one of Kenya’s leading mortgage finance providers in Kenya against a former manager in an employment claim on grounds of unfair termination. We are also seeking an order restraining any publication of the matter (a gagging order) which had been widely reported. Advising on a scheme of distribution or re-organisation of assets in a large estate under probate and administration proceedings. Represented foreign beneficiaries in a local probate and administration matter involving a large estate in regard to protecting the assets in the estate pending hearing and determination of the matter.